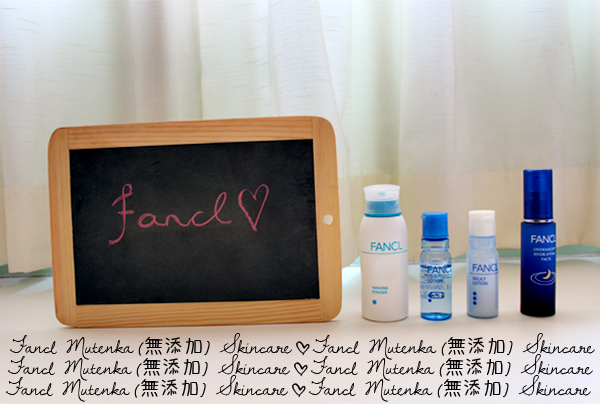 The event was the debut of Fancl's Basic Skincare range to the bloggers. I did a short introduction on each product that made up the range here. About a week after the event, I embarked on my month-long Fancl journey. Other than the makeup remover (Just because I have tons of half-used makeup removers in my loo. I'll do the review another time. ), I did not use another other skincare products during this period. Fancl's Washing Powder provides a superior yet gentle cleansing effect with foam that is dense, creamy, firm and elastic. 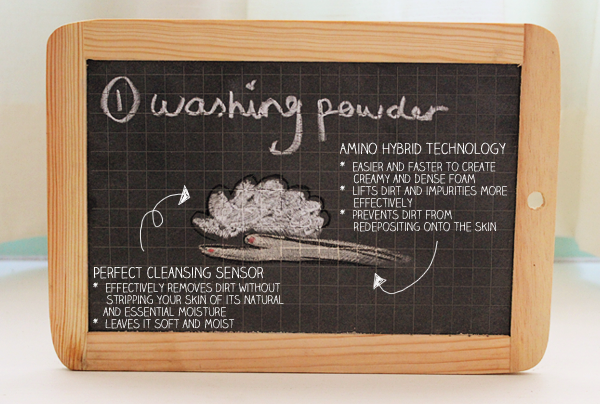 This foam acts as a cushion and so, reduces the friction generated when you wash your face. With its Amino Hybrid Technology, it lifts excess sebum and impurities from your skin, while retaining its moisture. It leaves skin soft and smooth. To use it, create dense and creamy foam out of the powder with a wet Washing Puff. Thereafter, smooth the foam over your face and massage with a gentle upward movement. Rinse with water. The Washing Powder comes in a white opaque 50g bottle. On the right side of the bottle, there is a transparent strip where you can see how much powder you are left with. The powder comes out fine and white, and smells a little like baby milk powder to me. As I didn't have the Washing Puff, I created the foam with my hands. Initially, it was rather difficult but just like what Jane, Fancl's Training Manager, it really got easier with practice. Okay, I'm not exactly sure if I did it the right way (Well, foam was created so I'm guessing I did it right? Haha.) but what I did was to pour out an amount of powder that was the size of a 50-cent coin onto my left palm and load up enough water to cover all the powder. Using my right hand, I mixed the powder and water in circular motions and basically lathered it up. My foam wasn't as dense as what was shown at the soirée, but it was enough for me to ensure that the skin on my palm did not come into contact with the skin on my face at any point of time when I was washing my face. After rinsing the foam off my face, my skin was left feeling clean and smooth. It had a very light feeling. My skin didn't feel tight after the wash but it didn't feel very moisturized as well. This is just a basic cleanser that does a fine job of what it is meant to do, cleanse. I read a review on Fancl's website that a reviewer saw a reduction in the number of blackheads she had. Perhaps I had't used it long enough (She had been using the powder for 2 years. ), but I didn't see any reduction in mine. 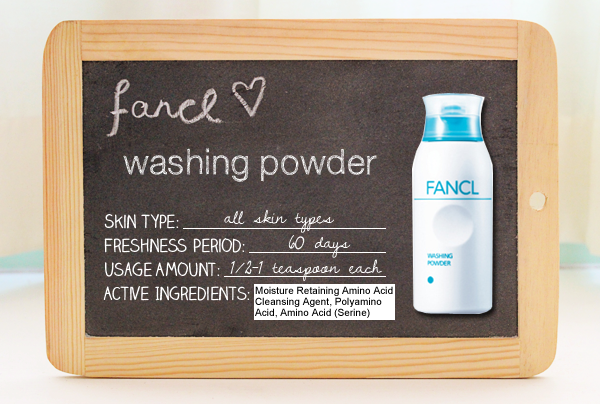 Fancl's Washing Powder is a basic cleanser that is perfect for those with the occasional skin troubles. I like that it makes my skin feel incredibly light and clean but I would have preferred it to be slightly more moisturizing. For those with very oily skin, Fancl has the Washing Powder Light for you. For those with very dry skin, I think you may want to look for something a little more moisturizing than this. One tip to know if a cleanser is suitable for you is to wait ten seconds after cleansing. During this period, if your skin feels tight, it's time for you to venture somewhere else. If your skin feels completely fine, no tightness whatsoever, well, good news! Your cleanser is your soulmate! 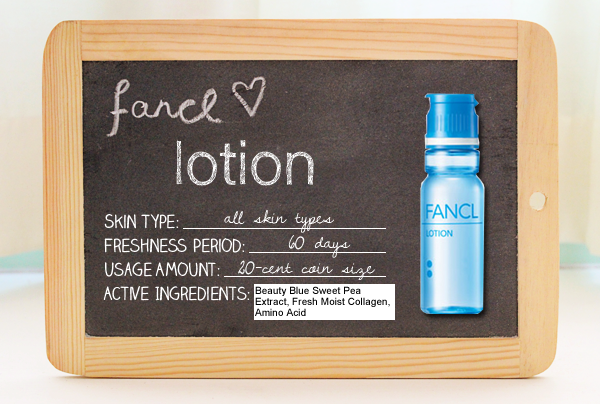 Fancl's Lotion contains Anthocyanin from the Beauty Sweet Pea Flower. It controls and helps to curb damage caused by environmental stress, dust and pollen. It also has Moisturizing Agents that enhances the penetration and delays their release so that you get a long-lasting moisturizing effect. To use it, pour a 20-cent coin size amount of lotion onto clean palm. Apply gently and evenly over your face. The Lotion comes in a transparent azure blue 30ml bottle. The lid lifts up to reveal a small aperture, from which you can dispense the lotion from. You do need to give the bottle a little shake though as the lotion comes out in droplets (Which is good because you can control the amount you want to dispense.). It has a light clean scent and is a tad viscous. I applied the lotion right after cleansing. I dispensed about 4-5 droplets of the lotion and then, gently patted the lotion into my skin. The lotion sank into my skin quickly and quite immediately, felt hydrated. The lotion didn't irritate my skin throughout the month. It left my skin feeling refreshed, moisturized and with no redness at all. Fancl's Milky Lotion too contains Anthocyanin from the Beauty Sweet Pea Flower, for protection against environmental stresses. 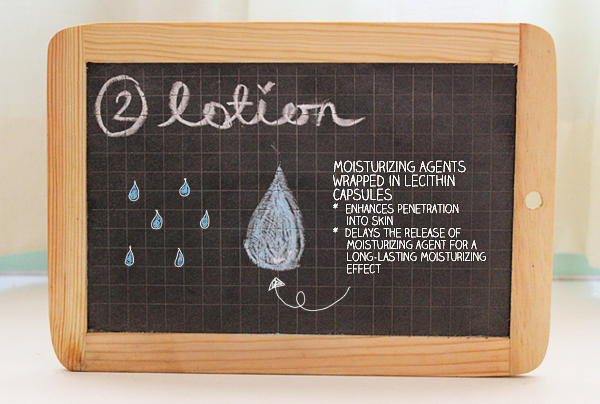 Veiling Agents, coated in Lecithin, help to seal in the moisture from the lotion and prolong its retention in your skin. To use it, pour a 10-cent coin size amount onto clean palm. Apply gently and evenly over your face. The Milky Lotion comes in a milky Alice blue 30ml bottle. Just like the Lotion's bottle, the lid lifts to reveal an aperture. You need to shake it a tad harder in order to get it out as it is more viscous than the Lotion. Do be careful that you don't shake it too hard because many a times, the droplets ended up everywhere but on my palm. It also has the same light clean scent, though a little stronger. 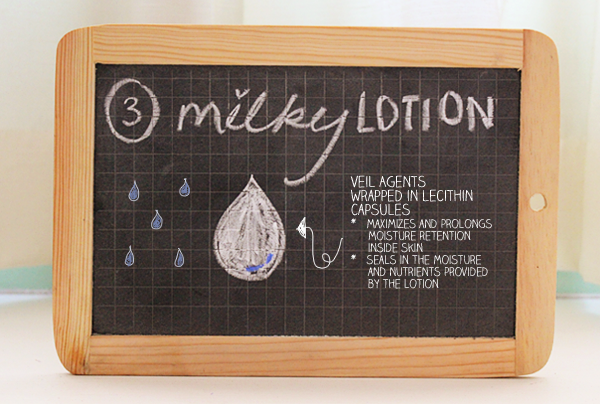 For the Milky Lotion, I dispensed about 2-3 droplets and then, gently patted it into my skin. As the Milky Lotion is thicker than the Lotion, it took longer for it to sink into my skin. It left my skin feeling moisturized but sticky. Under Singapore's unforgiving weather, a sticky complexion is pretty uncomfortable so I didn't use this during the day or under makeup. This was less uncomfortable at night because usually, I have my air-con switched on or I sleep directly under my ceiling fan (And pray that the fan won't drop on me. Not a fan of ceiling fans. Haha. Okay, sorry. Bad pun.). I woke up to really soft and well-moisturized skin with the Milky Lotion but I do wish that it was less sticky so that I could use it in the day as well. Dry skin will certainly seek relief in this but I would advise oily skin to eschew this and perhaps seek hydration in Milky Lotion Light. All in all, I really enjoyed my Fancl skincare regime. These products really embody the philosophy of Muteneka (無添加), which is a 'holistic approach to beauty' that 'advocates a lifestyle that is fresh, pure and safe – one that is pared down to essentials, free of additives and stressful elements.'. My skin felt really light and looked really clear. 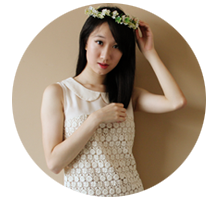 Each day, I looked forward to my skincare routine because I was enjoying it so much. Knowing that these products were preservatives-free, contained only the necessary ingredients and were healthy for my skin helped make the experience an enjoyable one too. I would recommend this range to those who are looking for a very basic skincare regimen, one with no frills. 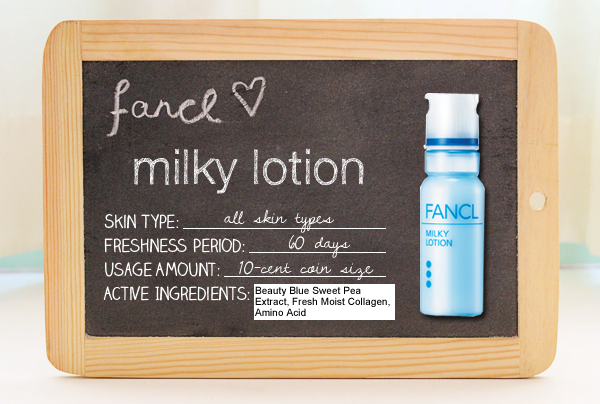 For those who are looking for a little more, Fancl has ranges like the Special Care, the Acne Care, the Whitening Care and the UV Care which you can add or replace with the Basic Skincare.